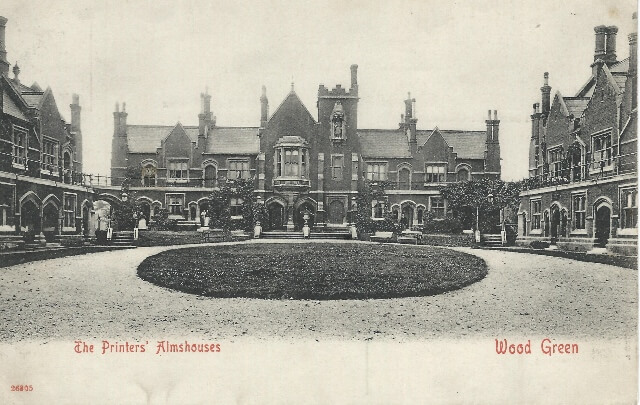 The Printers’, though not a City Livery Company, in common with other organisations in the mid 19th century, chose Wood Green as a semi-rural, healthy district in which to build almshouses for members of the printing trade, away from the increasing density and pollution of the metropolis. The Printers’ Pension Society Asylum was better known locally as The Printers’ Almshouses. They were inaugurated by Lord Stanhope in June 1856 and stood on the south side of Bounds Green Road opposite St Michael’s Church. The building was designed in Tudor style by William Webb who had designed almshouses in Wood Green for the Fishmongers’ and Poulterers’ Livery Company some nine years before. The building consisted of three ranges of almshouses around a courtyard facing the main road. Originally it housed twelve couples who received a weekly allowance. Each couple occupied a sitting room, bedroom and kitchen. The almshouses were extended in 1871 to accommodate twenty four couples and further extended in 1891. The almshouses were closed in 1969 and the residents transferred to Bushey in Hertfordshire. 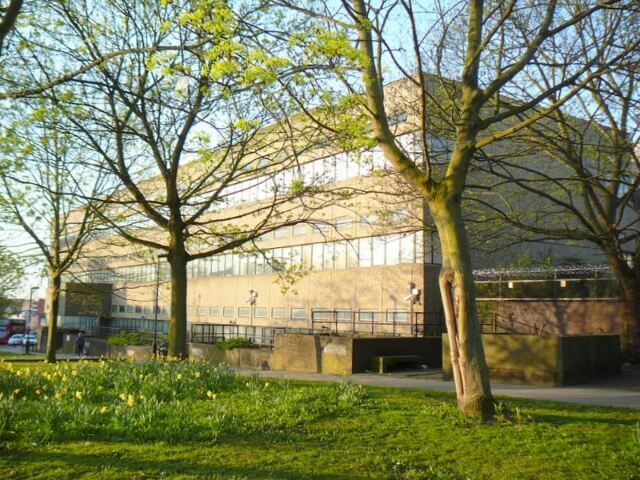 The buildings were demolished in 1970 to make way for the present telecoms facility which opened in 1974.